Check out the final standings from the group stages league table. 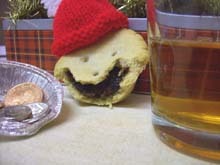 If you've stayed with us through the 27 mince pie essays that comprised the group stage, then you will no doubt be relieved to reach this last leg of our festive mull-marathon. The pies finishing as top four in the league are now pitted against each other in a straight knockout competition. Gladiatorial pastry combat, if you will. For those with no imagination, I've supplied a Readers' Pies image to keep handy while you read on. Each tie is decided by a panel of 'three good men and true', who each vote for their favourite. Simple, but astonishingly nerve-wracking. Friday, 12th December 2008, early afternoon. Today's panel includes regular partakers PC and Robert Meakin, plus an eager outsider in Richard Hildebrand. Of the two, MSD packs the greater early punch. Masses of crystallised sugar jolt the fruit into life, at the expense of finer spice tones. CON's start is a more gentle, considered blend, but it will need to get through the gears to catch the runaway MSD. CON impresses with its greater array of festive elements, while MSD boasts neither nuts nor alcohol, like a reverse celebrity wedding. Things are certainly tightening up in this tie. Each panel member has had to make a tough decision. By the final throws, MSD was still hammering out powerful festive flavour (unchanged from first oral contact) and CON had developed into a sophisticated dinner party guest of renown. A final score of 2-1 nicks it for M&S Connoisseur. So, who will meet our mincemeat Usain Bolt in the final? Next semi will appear here soon. Monday, 15th December 2008, a sunlit lunchtime. Following precedent, the panel includes two time-served indulgers in PC and Simon Wilson (although SW has been stoic in his resistance thus far) plus a newcomer to this pressured environment Roger Atkin. Will the royal debutante force his way into the crown already abdicated by the outgoing Queen of Somerfield? Or will the House of Spencer regain its throne? Mr Wilson's surprise at DUC's dishevelled appearance was shared by all. Perhaps MSL's bulbous star-covered lid had won the early mind games, explaining the distinct cower. The palpable anxiety has translated into poor initial bites dished up by both sides. Once through the buttery, if a little soft pastry, DUC seems bereft of festive charm. Where is the fruitcake attitude that stunned us into subjugation? After that dispiriting opening, one pie starts to perform, at last. MSL's moist and spicy fruit inners find their feet and DUC seems unable to respond to the convincing tang. The uniquely dry fill of DUC was once their strength but in this tasteless form, only serves to hamper their efforts. While DUC splutter and grind their way to a total breakdown, MSL are showing off their vibrant inner essence, with brandy the latest addition to an already comprehensive Christmas list of flavours. Being bland is totally unacceptable in these savage final stages of competition, and Mr Atkin brings a veil down on proceedings by highlighting the musky aftertaste. We very rarely get such an easy decision at this high level of pie play. The panel is united in their condemnation of the pie that let itself down. M&S Luxury take it 3-0, and DUC are lucky to get as much as 0. How disappointing that I had such an accomplished batch to sample in the earlier rounds, and then they serve up this meaningless filth next time out. 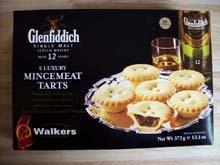 You've got to feel for the consistent, if not very festive, Walkers Glenfiddich clan. They finished fifth and must be thinking �We'd have given it a real go this year�. Shame on you, Your Royal Highness. Therefore, M&S have taken a stranglehold on this competition once more, and very much like 2004 we don't just have a final, we have a Marks & Spencer, all butter, deliciously fruity finale. A word of warning though � the finalists (M&S Connoisseur & Luxury) are getting harder to come by, by the hour. We are obviously doing too good a job at recommending them, and the nation has nearly sold out. So remember to panic buy any you see. Wednesday, 17th December 2008, high noon. In order to widen participation and given the importance of this judgement, the panel contains arguably the biggest pie eaters of Pie Club 2008. PC, Robert Meakin, Jon Callow and Simon Wilson have an estimated 200 pies under their belts (or spilling over). Yes, I know that's four panel members and not the usual three - it's helpful to have four in case someone suffers chronic raisin syndrome, and bows out. That's enough ado. Bring on the pies! Both Marks & Spencer powerhouses are unsheathed, and emerge blinking into the midday sun. These brandy-soaked bedfellows are more at home on the arm of a fireside Chesterfield than a stark office desk. CON is first to the palate, and coats the inner cheeks with boozy shortbread crumbs. A sweetness from MSL cuts through the buttery fog, and then washes the digestive front step with its liquid fruit charms. Both CON and MSL exhibit their heart-warming spirit, emitting brandy benefits to all who explore their crust. The battle comes down to a scrap between CON's nutty crunch and MSL's fruity bursts. With a tear, the last mouthfuls of Pie Club 2008 are despatched to the annals, and the panel must now determine which member of the M&S family will hold bragging rights for the next 10 months or so. The bookmaker's favourite � CON, did nothing to dampen the clamour for its new look six. It has been undeniably professional throughout, despite the frantic attempts to fracture its controlled serenity. MSL raised its game to match posh neighbour CON blow for blow, and in many ways would be a worthy winner. �It has that mark of individuality, that element of surprise, lacking in its consistent, albeit worthy congener.� Remarked Mr Wilson. �..brandy ago-go, with a nutty motif and a luxurious gathering of fruits that linger long after the chew is over.� Spouted Mr Callow. Congratulations to all involved in its development and production! There's no faulting this pie polymath, but landing a box has resembled a quest the Argonauts would struggle with. Having had many reports of an early sell-out in the M&S Food Halls of the North, I've had an awkward telephone conversation with the relevant department (via Buxton and Macclesfield stores) and they assured me that they have amended their ordering system. Only time will tell whether I've been fobbed off or taken on. So that leaves only the thank yous left this year. A massive thank you to Simon Wilson, without whom this space on the web would just be a dusty void full of nothing but echoes of Rick Astley and googled Britney images. My considerable gratitude goes to anyone supplying a pie second opinion or featuring in a panel, especially the two giants in their field � Jon Callow & Robert Meakin. Anyone having wasted their lunch hours over us � cheers. Finally, big love to my wife for letting me ruin her Christmas. Every year. After more than five weeks of deep filled investigation, I�m proud to say that we�ve reached the last pie of the group stages. So many highs and lows, I�ve had both tremendous mincemeat experiences and spat out more unsavoury titbits than Andrew Sach�s vilified answerphone. Like any other worthwhile club, I�m ending on a single malt whisky adventure, as today we meet Walkers� Glenfiddich collaboration. Black as night, to dissuade the juvenile nibbler no doubt, this is possibly the only sweet snack product to feature a double measure of whisky next to an image of the treats held within. The crumbshot follows the familiar Walkers 2-3-1 formation, with their lone striker clean cut and internally neat. Incidentally, I have purchased the �old style� box. I noticed on a more recent visit to the vendor that a new sleeve is available with an emphasis on graphic design, rather than getting slaughtered on firewater. Brown plastic inner tray (bagged). This robust intruder from the north does itself no favours by sticking with the �tart� moniker. Make no mistake though, this is no girly open-top hairdresser, but a full on 100% bruiser of a pie, complete with lid. One doesn�t have to look or sniff too hard to appreciate the alcoholic pretensions�the whisky vapours are only too happy to escape their confines. Three generous air holes afford a closer appreciation. Last years offering was beset with an experimental(?) acidic infusion so it was with some trepidation that I clamped my jaws around this beast. I need have no such fears this time around with no acetic unpleasantries detected. The pastry offers a near perfect crunch resistance, willing to offer a good workout but always inviting another bite. They haven�t scrimped on the inners here either. No discernible cavity was detected betwixt filling and lid; often the Achilles heel of the modern pie. Unfortunately, despite the highest second opinion score this season, they have missed out on the Pie-Offs by a couple of points. Commiserations to all the single malt fans out there. That leaves the knockout stages to be contested by three Marks & Spencer varieties (Deep Filled, Luxury and Connoisseur) and Prince Charles� Duchy Originals. Semi-Finals and Grand Final to be staged as soon as is practicable. Hold fast! Your champion will be crowned soon enough, sirs. It�s taken a while, but we have at last reached the focus of much Press attention following Which? Magazine�s review of ten pies earlier this season. 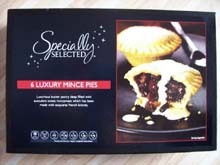 Aldi Luxury Mince Pies may sound oxymoronic, but who are we to prejudge? They may yet make oxyfools of us all. Jet black throughout, allowing the crumbshot to take centre stage. Glisten levels on the spilling fruit are phenomenal. A brave use of the notoriously hard to coax brandy sauce embellishment. The blurred spoon to the rear is a timely reminder that if you�re going to toss the sauce around, you�ll have to trouble the cutlery drawer. Do my cholesterol-thickened eyes deceive me? 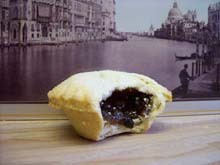 What stands before me is the living embodiment of Marks & Spencer�s Classic mince pie (MSC). This is all too Dickensian. Were these two pies born to a poor mother, one going on to be adopted by the wealthy Merchant for whom she worked, much too personally � some would say. The other left to struggle its way to success through a guile/work ethic combo. The nature/nurture debate has its say in the filling�s individuality. There is an abundance of the glucose syrup and brandy binder, with the 2.3% warmth of the nip fighting the cooling glucose for control of the hearts and minds of the festive demographic. Disaster has struck for Aldi�s near-anagrammatic Teutonic twin Lidl. Apparently, there is a problem with the supply of their mince pies, and certainly Chesterfield were literally unable to produce the goods. So if you�re doing your big shop at Lidl this Credit Crunch Christmastide, think on that you�ll need to pop into somewhere else for your bits.